Greetings visitor! Pull up a seat at my table, shuffle up, and let's play. I am a design engineer by trade and gaming runs in my blood, so this project is like a culmination of my two loves. The Scroll Play is a (patent pending) cylindrical container for your cards (or other things) that also includes an easily removable playmat. To open for play, simply set the cylinder on the table, hold the flap of the mat so the magnets unsnap and unroll the scroll. The first thing you notice when you roll it out is appreciative comments from other players. Now the container can be removed from the mat if necessary and your cards and other objects can be accessed through opening any one of the three magnetically latched lids. The entire assembly can be stashed away in a bag, held as is like one would carry around a fat pack box, or even held with a strap connected to any of its ends. Going to Magic the Gathering events I have observed and felt that there must be an easier way to transfer all the things necessary to play. At prereleases, for example, I usually come equipped with a playmat, card sleeves, basic lands, a pen, paper, dice, tokens, and a space to hold cards from that day's packs. So to that end I came up with something that functions as storage for all these things that is quick to deploy and undeploy, especially with regards to the playmat. The playmat, which serves as a nice protective layer between card and table, did not have a definitive storage solution. I've seen them crumpled or rolled up as best as possible and thrown into backpacks, which can't be good for its overall condition. I've seen them rolled up and held underarm which seems awkward and limits your arm mobility. I've even seen them rolled up and put into protective tubes, which is just an extra part and a bit silly, or as the Tolarian Community College Professor might say, a piece of plastic to protect the rubber and cloth that protects the plastic that protects your cards. So this design seeks to use the playmat as an outer covering for the container while the container helps the mat to keep its shape with its cylindrical surface. The magnets on the container and mat allow the mat to snap and center to the container which ensures that the mat rolls up evenly. The magnets on the other side of the mat snap to the same magnet stack and correct any minor misalignment in rolling. During play you can either keep the scroll on one side of the mat or it can be easily removed and placed elsewhere if you need more mat space. New for roleplayers! A dry erase mat design for your dungeon mastering needs. See update 6 or the relevant entry in the mat section for more details. Mat measurements: 24" x 14"
which can each hold: ~ 75 single sleeved cards or a box of Dragon Shield sleeves. As a side note you can stash mini pens in the space below the hinges! Though additional colors adds to the molding costs, I felt it necessary to add some variety. So I plan on starting with the base mana colors for the end caps and lids. Additional colors may be added if the project gains enough traction. So we have the base black, white, blue, red, and green. The photos below are merely renders, the colors may vary in hue once I settle on a specific tone. As an added bonus to all backers, you can mix and match your lid and end cap colors! This is not a service I plan on offering for regular retail, at least not at the base price. Your choices will be collected in the backer survey at the end of the campaign. So many possible combinations! Khan colors, Guild colors, you name it. Is this island part of a Kiora archipelago? Let's get back to the farm. Gideon little doggies! Time for a Chandra scenery! Let's go hiking! A Yu-Gi-Oh themed playmat for all you duelists out there, created by lina01 on deviantart. It has the pendulum colors and the elemental attributes on 3 summoning circles. Is summon out there? Anyone? Let's duel! NEW! A dungeon master grid. This new mat construct includes an attached polycarbonate sheet for dry erase markers! See update 6 for more details! If there's a type of art you'd like to see on a playmat, please go ahead and leave a comment. Also note that all mats will have back masking dots where the magnets go for a cleaner look. You may also order additional mats via add-ons to your pledge. You can carry the Scroll Play underarm like an archivist (then try tapping it to see if you draw a card) or you can hold it via one of the options below. To add an add-on to the pledge, just add the appropriate amount outlined in each option below to your pledge and then note your choice in the end survey which will be sent out at the project's conclusion. You may need to click on the manage my pledge button and change the amount there. Each strap makes use of the #8-32 threaded inserts I've embedded in the sides. Please note that you'll need to disengage the straps before deploying the mat so be aware of space concerns. Straps can be stored in pocket or even in one of the compartments. Guitarists, as a note for you, if you have extra guitar straps and want to use them, just screw in 2 guitar strap buttons to the ends of this scroll and voila, you get a nice and easy carry option. [$9] Half Strap - This is my personal favorite carry method. One nylon strap loop connected to one end of the Scroll Play via a D-ring and carabiner for quick release. You can carry like a lantern, a bag, or throw it over your shoulder. Having only one end with strap hardware allows you to stand the scroll on the other end, as the scrolls are sufficiently balanced to allow for standing upright when normally loaded. Please note that you should not use the strap to sling it around your head like Mjolnir. The mat magnets can't handle that kind of force. [$10] Duffel Strap - This strap is two feet in length with two integrated clips on either end that attach to D-rings on either side of the scroll. You can carry it like a duffel bag or sling it over your shoulder like a rifle. [$14] Adjusting Strap - You can adjust this strap from 3 to 6 feet. With two plastic swivel clips on either end that attach to the D-rings on the scroll. Set it on your shoulder like a messenger bag. [$15] Additional mats. This add-on is for people who just can't seem to get enough of the art mats or maybe just want to stock up. These mats come with the embedded magnets. Max of 5 per pledge. [$3] Mat magnet set. Have your own mat you want to use? Just use some epoxy (not included) and these magnets to make your own. I will provide a drawing and procedure but the result will be your responsibility. Your mat needs to have room for these magnets. Center to center the magnets are 23-1/8" away from each other length-wise and 11-9/16" width-wise. The magnets themselves are 3/8" in diameter. See drawing here for more details. Note, I only recommend doing this if you are familiar with epoxy, have epoxy, and consider yourself handy with a ruler and blade. [$66 ($64 for early birds)] A second scroll play. Got a buddy/partner/spouse that would like one of their own? Just add another $66 to your pledge for a 2nd one. If you are in the Early Bird pledge level you may instead add an extra for $64 so as to keep in line with your original pledge. I will need to get the 2nd scroll play details such as color and mat choice via email instead of the survey at the end. Limit 1 extra per backer. Well for one, I love Kickstarter. I have backed a lot of cool projects on here and wanted to someday launch a cool project of my own. For something of this size and complexity, it only made sense to have it injection molded. I had designed this scroll to have as few parts as possible while having each individual part be a simple two part mold, but even simple molds are quite expensive. So the goal is to pay for low volume aluminum molds and enough for the materials to make enough Scroll Plays to cover that cost. In any case, if you've made it down this far, thank you for taking the time to look at my kickstarter, and if you can, please help by pledging and/or spreading the word. In December of 2014 I had the idea to make a mat/container combo. My first design was half printed parts and half cut plastic slats. The containers opened upward. As you can see a mess ton of screws were involved and the plastic parts were not easily injection moldable as I only wanted a proof of concept. Even with my shaky hands cutting the slats the scroll still came together and worked perfectly. In April of 2014 the patent application was submitted. In May of 2015 I completed the 2nd prototype after going through a redesign for injection molding and parts reduction. Instead of 2 end caps, 6 lids, 2 partitions, and 5 slats it was pared down to 3 lids, 2 end caps, 1 container and far less connective hardware. In addition, all parts are made from simple two part molds without complicated side actions during the operation. Also, a way to add straps were added. One risk is having the plastic components being shipped in time. There is both a long lead time for mold making as well as parts manufacture. The second risk is being able to assemble the parts in a timely manner. I have made assembly as easy as possible but the epoxy portions will be the timing bottleneck. Such assembly can be subcontracted out and so I do not see too much of an issue there. Thanks for supporting! Your name will be added to our supporters list on the website. Get your choice of one of the featured art mats. These mats will not have magnets in them. You get a Scroll Play container only with a set of 6 magnets so that you can alter your own personal mat. Colors for your container to be chosen during the survey given at the campaign's conclusion. Don't forget to check out the add-ons section if you want to add a strap to your pledge! Thank you for your early support! You get a full Scroll Play which includes the container and your choice of play mat. Colors and playmat to be chosen during the survey given at the campaign's conclusion. Thank you for your support! You get a full Scroll Play which includes the container and your choice of play mat. Colors to be chosen during the survey. Thank you for your support! This level will receive their scrolls ASAP. I will endeavor to get these out before the end of the year. You get a full Scroll Play which includes the container and your choice of play mat. Colors and playmat to be chosen during the survey given at the campaign's conclusion. You 3 full Scroll Plays which include the containers and your choice of play mats. Colors and playmats to be chosen during the survey given at the campaign's conclusion. Don't forget to check out the add-ons section if you want to add straps to your pledge! Need an engineer to assist you? Get at least 20 hours of help for your project. 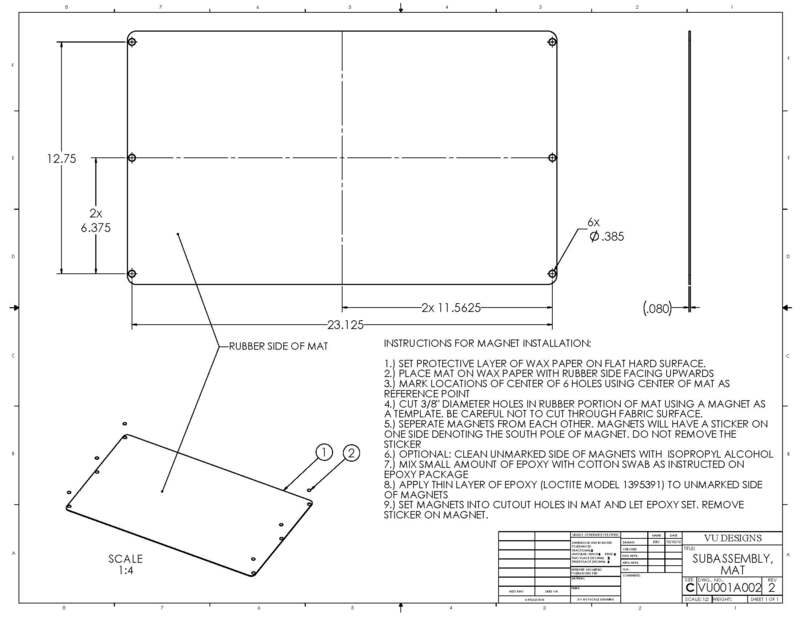 I can review drawings, minimize number of parts in a device, assist in injection molding/plastics/sheetmetal/mechanism design. I may also be able to do solid modeling depending on what software you are using. Addendum: I can not assist you if the project is a medical device or 3d printers. 8x Deal! Save a little on shipping and price! Only available for US backers. You 8 full Scroll Plays which include the containers and your choice of play mats. Colors and playmats to be chosen during the survey given at the campaign's conclusion.